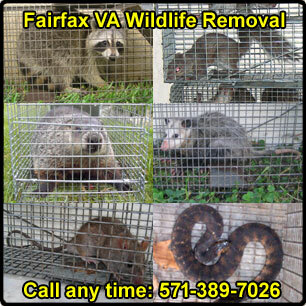 We operate a professional Annandale wildlife removal company based out of Fairfax County Virginia. We specialize in the resolution of conflicts between people and wildlife. Examples of common jobs that we do include the removal of squirrels in attics, complete rat removal and prevention, removal of bats from buildings, bird prevention, raccoon trapping, snake removal, and more. We remove dead animals from homes, repair wildlife damage, perform full home inspections, clean up wildlife waste and clean attics, and do 100% wildlife prevention work. We are not a standard Annandale exterminator or Annandale pest control company. We specialize in Annandale animal removal only. Give us a call any time at 571-389-7026 and we will listen to you describe your wildlife problem, and schedule an appointment to solve your Annandale animal problem. Do you have a garden growing lot of vegetables and fruits in it? Then you have surely faced the problem of groundhog. It is a big rodent notorious for destroying the yards and grounds by making mounds and tunnels in it. Therefore it is very important to oust this destructive animal from your property as soon as possible. Catching the groundhog is not as simple but it is essential to trap and remove the animal from your house. But you have to keep one important thing in mind that there are a lot of states that might have hard regulations about trapping and relocation of the wild animals and that it is worth checking on rules in your local area. The groundhogs are also considered to be a cute animal that is an important part of American culture but they can also cause great damage. Most of the people want to use a live trap that can catch groundhog in the cage as it is the cleanest way to deal with this animal. The traps are available in different sizes but usually a trap of one foot high and two and a half feet long will be sufficient. There are also lethal traps available in the market for the same purpose but most commonly people want to adopt cage trap and it is considered the most successful trap of all as well. After trapping the groundhog successfully the next step is to remove it properly. Put a cloth sheet or a blanket on the cage and put the cage in your vehicle so you can release it far away from your residence. Putting sheet on the cage may calm down the animal. Choose wooded and shaded area with a plenty of water to release it. You may ask the local law enforcement to dictate about the best possible location to release it. •	Put the trap down and open the door to release the animal. Be very careful while setting it free and keep enough distance from cage. •	Do not get close to this wild creature as it has quite sharp teeth. •	Don’t forget bungee and attach it to release of the live trap. •	Wash the trap thoroughly after the business is ended to kill all sorts of odor.